Illegitimate son of Alexandere Dumas, the famous author of many adventurous novels. His mother Marie-Catherine Labay was a dressmaker. His father formally recognized him in 1831 and he was taken away from his mother (who tried to run away with him). He grew up in boarding schools, where he was pestered with his illegitimate birth. In 1844 he went to live with his father (who had divorced his wife) in Saint-Germain-en-Laye. He met the courtesan Marie Duplessis, who was his lover between September 1844 and August 1845. She died of tuberculosis on 3 Feb 1847 and was the inspiration for his succesful novel "La Dame aux Camélias" (1848), that helped him pay off his debts and enabled him to support his mother financially. The book was turned into a play that was first performed on 2 Feb 1852 and on which Verdi based his opera "La Traviata" (1853). In 1850 Lydie Zakrefsky, daughter of count Zakrefsky, became his mistress in Paris. His play "Le Demi-Monde" (1855) was eyed with suspicion because of it's portrayal of French society, but it was a succes. Dumas became friends with the writer Jules Vernes and introduced the latter to his future publisher Hetzel. In 1864 he married the Russian princess Nadeja Naryschkine. She had been his mistress for several years during her marriage to prince Alexander Grigorievich Narishkin and they already had a daughter, Colette, born in 1860. In 1867 another daughter was born, Jeanine. In 1874 he was elected to the Académie Francaise. By then he had written many novels and plays and more were to follow. In 1894 he received the Légion d'Honneur. After Nadeja died in April 1895 he married his mistress of many years, Henriette Régnier in June 1895. He died six months later. Novels: "Tristan le Roux" (1850); "Diane de Lys" (1853). Plays: "Le Fils naturel" (1858); "L'Étrangère" (1876); "Denise" (1885). 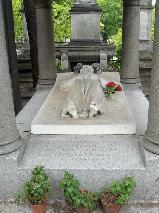 The grave of Alexandre Dumas fils at Montmartre Cimetière, Paris.